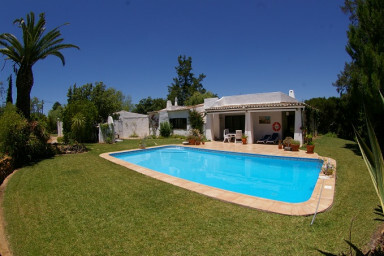 Casa Prince is a very nice holiday rental villa that offers comfortable accommodation for 6 people. Built on a plot with 2725m². Casa Prince is a very nice villa that offers comfortable accomodation for 6 people. Built on a plot with 2725m2, with a big private pool, terrace and BBQ. Located in a residential area of Serra e Mar, 10 km away from the beautiful beaches of Alvor and with easy access to 6 international Golf courses. The villa has 3 bedrooms and 3 bathrooms with shower and toilet . The spacious living room (80m2) gives us access, through sliding doors, to the terrace and swimming pool area. This room is equiped with Air-Conditioned, to help you endure the summer's hot weather. It is also equiped with satelite TV and there's free wifi in the whole house. Also, all the other house divisions are equipped with all the necessary equipment and facilities. In order to provide our guests a comfortable stay, we have at your disposal a washing machine, a large fridge with freezer, bedlinen, maid service twice a week and pool cleaning service once a week. In the terrace and pool area, once can find an exterior shower, gas operated BBQ and a roof terrace for the die-hard tanners. In the area, one can find several sports facilities, such as Golf courses, diving activities, walking, waterparks, fishing, jeep safaris, horse rising and much more. The rental price includes gas, water and electricity expenses during summer . During the winter months utility costs are paid as an extra based on consumption. We enjoyed casa prince a lot, quit, space, garden etc.